Reminiscing about the spectacular Sydney whisky season last year, I remembered "Dramtacular" (aka dram spectacular), an event you may have seen the photos of over on our Facebook page. David Vitale, founder of Starward Whisky / New World Whisky Distillery and friend of TimeForWhisky.com, along with Gee David, Brand Ambassador of Bruichladdich and Martin Lynch, Australasian Ambassador for Teeling Whisky co-hosted the Dramtacular event and presented key expressions from their portfolio, including the Teeling Single Grain and Small Batch expressions (see our post here for two other exciting Teelings released last year). Right after the tasting session, I caught up with David (of Starward) and Jeremy (of the Whisky Room) about the Starward core expressions and their New World Projects range. It was then they mentioned the New World Projects Double Cask Release #1, which Jeremy had recently added to the Whisky Room collection. 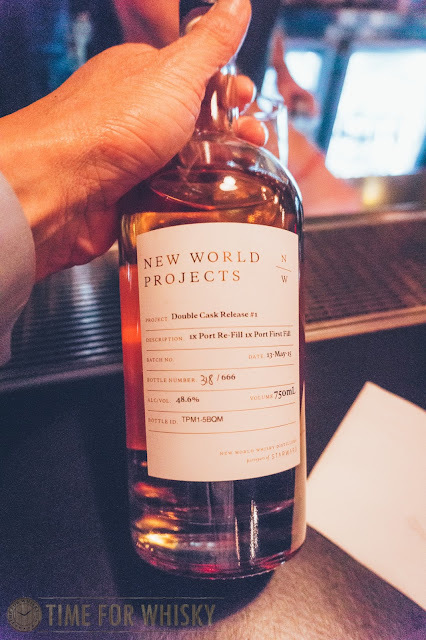 This release from New World Whisky Distillery (NWWD) combines malt from two different tawny barrels - the first being a refill barrel, the second being a first-fill barrel. Being a fan of the Glenmorangie Quinta Ruban port finished malt, this was a particularly exciting release and one which I expected to (and did) thoroughly enjoy. Another exciting release from NWWD that makes use of traditional tawny barrels. This release actually takes the malt from two different barrels and marry them together (as compared to previous releases where malt are taken from one barrel then into another). The result? A fun and delicious whisky that you can have on a beautiful spring day, or as a post-lunch dram. Nose: The nose is filled with citrus, pineapple, loads of vanilla, almond shortbread and vanilla cheesecake. Delicious and enticing. Palate: The palate begins with a layer of caramel that gradually develops into citrus and honey notes. Finish: Long and fulfilling with a gentle ginger spice finish that over time dries out into a vanilla note.